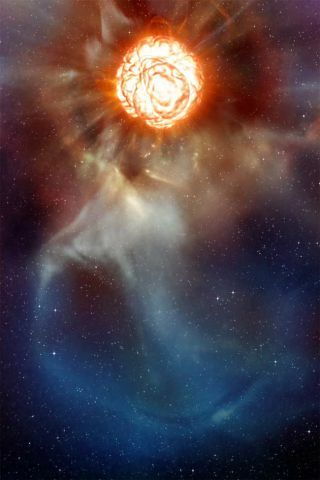 The supergiant star Betelgeuse has a vast plume of gas almost as large as our Solar System and a gigantic bubble boiling on its surface, shown in this artist's impression. As a largestar nears the end of its life it begins to shed mass at a tremendous rate. Newobservations of the supergiant star Betelgeuse may help scientists finallyunderstand how this featof weight loss is achieved. Views fromthe European Southern Observatory's Very Large Telescope in Chile reveal a vastplume of gas spewing off of Betelgeuse, the shoulder star in the Orionconstellation. This behemothstar has about 20 times the mass of our sun, but is losing about one sun'sworth of mass every 10,000 to 100,000 years. That rate ofslimming may not sound like a crash diet, but it is about a million timesfaster than the rate at which the sun loses mass. "Mostlyevery star goes through such a phase at the end of its life," saidastrophysicist Pierre Kervella of the Observatoire de Paris-Meudon in France. "We know the mass is going out, but we don?t know how it is expelled fromthe star." Theobservations of the plume imply that Betelgeuse is not shedding mass evenly inall directions. Perhaps the plume is created by the rotation of the star, whichmay drive mass toward the poles where it could overflow into a spray ofparticles. Or maybe gasis expelled in bubbles by convection, the same process that circulates water ina heating pot. Scientists think convection could transport gas upward towardthe star's surface, and that the momentum of this movement could cause some gasto be expelled when it reaches the surface. There issome data to support both possibilities, and it's possible that they work inconcert. "Thereis a coincidence between the polar axis of the star and the direction of theplume," Kervella said, lending support to the rotation hypothesis. "But convection appears more probable currently, because there are someobservations which show that there is gas motion on the surface of thestar." At thisrate, Betelgeuse is speeding through its remaining mass and is set to diein a supernova explosion within the next 10,000 years. "Maybeit will explode in a few thousand years, but it could also be next year,"Kervella told SPACE.com. "We don?t know exactly. It has probably lived 90to 95 percent of its life." The star hasalready exhausted its store of hydrogen by burning it up in nuclear fusionreactions, and has moved on to burning helium and heavier elements in a stagecalled thered giant phase. These reactions tend to produce more heat than occurs whenburning hydrogen, with the effect of inflating the star to a much larger volumethan when it was young. BecauseBetelgeuse is expanding in size while losing mass, its density has become verylow: the star is now about a billion times less dense than the air on Earth. Thisincredibly low density helps enable the star's mass loss. Gas on the surface ofBetelgeuse is so far from the center of the star's gravity that thegravitational hold on it is weak and it can easily slip away. Kervella,Keiichi Ohnaka of the Max-Planck Institute for Radio Astronomy in Germany, andcolleagues detail the new findings in a pair of papers set to be published inthe journal Astronomy and Astrophysics.